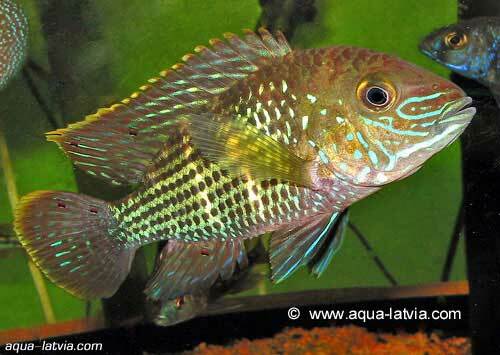 Green Terrors are South American Cichlids originating in still waters in Peru and Ecuador. Subspecies include the gold saum and the white saum. Their color changes to green at maturity for both males and females, if they have a proper diet and water conditions. Generally the males are brighter, while females are darker and somewhat smaller than the males. Numerous dark spots run in parallel lines across the body. The tail is often the brightest area and can be edged in reddish orange. The males develop a broad forehead with a pronounced hump. Green Terrors are very aggressive and should not be kept with their own kind - there is good reasoning behind their name. A pair of Green Terrors must be watched very carefully if there are other cichlids in the tank, as the Terrors will kill other inhabitants when they begin to breed. A Green Terror should be kept in a tank of at least 50 gallons. A single Green Terror in a tank can act as a calming force on other aggressive species. The tank should be well planted and provide rocks, driftwood, caves and hiding areas. Clay pots work very well. Like most Cichlids, Green Terrors will accept a variety of foods, including flake foods, freeze dried bloodworms and Cichlid pellets. Mature males establish and control a territory. During breeding, aggression toward the female and other species is extreme. Hundreds of eggs are fertilized against a clean vertical surface. Both parents will aggressively defend the young until the fry reach an age where the parents can't control them.